The sprawling, open world of Fallout 3 is inhabited by all manner of humans, mutants and monsters, and packed with hundreds of things to do. 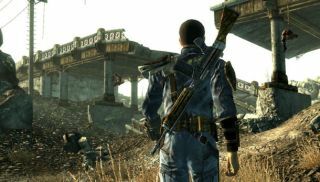 It easily offers dozens of hours of gameplay in the Capital Wasteland, and hundreds for gamers who immerse themselves deeply into its bleak, post-nuclear world. But as speedrunner BubblesDelFuego demonstrated over the weekend, it can also be wrapped up a little more quickly than that. Beating Fallout 3 in 24 hours is impressive enough in my eyes, but 24 minutes? I took longer than that to decide on my perks. And in all honesty, this world-record speedrun through the game doesn't look like a whole lot of fun. But it is almost unbelievably quick, thanks in part to gameplay tricks that take advantage of oddities in the Gamebryo engine. "Load clipping," for instance, lets players pass through solid objects, while the skillful use of quicksaves and quickloads allows sections of dialog to be skipped. The character build emphasizes endurance and intelligence to maximize survivability while running through enemy fire and irradiated water, and of course the player obviously has a pretty good degree of familiarity with the game as well. The mark of 23:55 is the first recorded Fallout 3 speedrun under 24 minutes and bests the previous record , which DelFuego set himself earlier this month, by 25 seconds. And while it's never safe to predict such things, I'm going to go ahead and say that I expect it will stand for quite awhile—DelFuego wrote on YouTube that he won't try to improve on it "unless something big is found, or if the record is taken by some good competition."